Earth is no stranger to meteors. In fact, meteor showers are a regular occurrence, where small objects (meteoroids) enter the Earth’s atmosphere and radiate in the night sky. Since most of these objects are smaller than a grain of sand, they never reach the surface and simply burn up in the atmosphere. But every so often, a meteor of sufficient size will make it through and explode above the surface, where it can cause considerable damage. A good example of this is the Chelyabinsk meteoroid, which exploded in the skies over Russia in February of 2013. This incident demonstrated just how much damage an air burst meteorite can do and highlighted the need for preparedness. Fortunately, a new study from Purdue University indicates that Earth’s atmosphere is actually a better shield against meteors than we gave it credit for. Their study, which was conducted with the support of NASA’s Office of Planetary Defense, recently appeared in the scientific journal Meteoritics and Planetary Science – titled “Air Penetration Enhances Fragmentation of Entering Meteoroids“. The study team consisted of Marshall Tabetah and Jay Melosh, a postdoc research associate and a professor with the department of Earth, Atmospheric and Planetary Sciences (EAPS) at Purdue University, respectively. In the past, researchers have understood that meteoroids often explode before reaching the surface, but they were at a loss when it came to explaining why. For the sake of their study, Tabetah and Melosh used the Chelyabinsk meteoroid as a case study to determine exactly how meteoroids break up when they hit our atmosphere. At the time, the explosion came as quite the a surprise, which was what allowed for such extensive damage. When it entered the Earth’s atmosphere, the meteoroid created a bright fireball and exploded minutes later, generating the same amount of energy as a small nuclear weapon. The resulting shockwave blasted out windows, injuring almost 1500 people and causing millions of dollars in damages. It also sent fragments hurling towards the surface that were recovered, and some were even used to fashion medals for the 2014 Sochi Winter Games. But what was also surprising was how much of the meteroid’s debris was recovered after the explosion. While the meteoroid itself weighed over 9000 metric tonnes (10,000 US tons), only about 1800 metric tonnes (2,000 US tons) of debris was ever recovered. This meant that something happened in the upper atmosphere that caused it to lose the majority of its mass. This new code allowed them to fully simulate the exchange of energy and momentum between the entering meteoroid and the interacting atmospheric air. During the simulations, air that was pushed into the meteoroid was allowed to percolate inside, which lowered the strength of the meteoroid significantly. In essence, air was able to reach the insides of the meteoroid and caused it to explode from the inside out. This not only solved the mystery of where the Chelyabinsk meteoroid’s missing mass went, it was also consistent with the air burst effect that was observed in 2013. The study also indicates that when it comes to smaller meteroids, Earth’s best defense is its atmosphere. Combined with early warning procedures, which were lacking during the Chelyabinsk meteroid event, injuries can be avoided in the future. This is certainly good news for people concerned about planetary protection, at least where small meteroids are concerned. Larger ones, however, are not likely to be affected by Earth’s atmosphere. Luckily, NASA and other space agencies make it a point to monitor these regularly so that the public can be alerted well in advance if any stray too close to Earth. They are also busy developing counter-measures in the event of a possible collision. If the hoped-for meteor blast materializes this Friday night / Saturday morning (May 23-24) Earth won’t be the only world getting peppered with debris strewn by comet 209P/LINEAR. The moon will zoom through the comet’s dusty filaments in tandem with us. Bill Cooke, lead for NASA’s Meteoroid Environment Office, alerts skywatchers to the possibility of lunar meteorite impacts starting around 9:30 p.m. CDT Friday night through 6 a.m. CDT (2:30-11 UTC) Saturday morning with a peak around 1-3 a.m. CDT (6-8 UTC). While western hemisphere observers will be in the best location, these times indicate that European and African skywatchers might also get a taste of the action around the start of the lunar shower. And while South America is too far south for viewing the Earth-directed Camelopardalids, the moon will be in a good position to have a go at lunar meteor hunting. Find your moonrise time HERE. “Anyone in the U.S. should monitor the moon until dawn,” said Cooke, who estimates that impacts might shine briefly at magnitude +8-9. “The models indicate the Camelopardalids have some big particles but move slowly around 16 ‘clicks’ a second (16 km/sec or 10 miles per second). It all depends on kinetic energy”, he added. Kinetic energy is the energy an object possesses due to its motion. Even small objects can pack a wallop if they’re moving swiftly. Bright lunar meteorite impact recorded on video on September 11, 2013. The estimated 900-lb. space rock flared to 4th magnitude. Lunar crescents are ideal for meteor impact monitoring because much of the moon is in shadow, illuminated only by the dim glow of earthlight. Any meteor strikes stand out as tiny flashes against the darkened moonscape. For casual watching of lunar meteor impacts, you’ll need a 4-inch or larger telescope magnifying from 40x up to around 100x. Higher magnification is unnecessary as it restricts the field of view. I can’t say how easy it will be to catch one, but it will require patience and a sort of casual vigilance. In other words, don’t look too hard. Try to relax your eyes while taking in the view. That’s why the favored method for capturing lunar impacts is a video camera hooked up to a telescope set to automatically track the moon. That way you can examine your results later in the light of day. Seeing a meteor hit live would truly be the experience of a lifetime. Here are some additional helpful tips. On average, about 73,000 lbs. (33 metric tons) of meteoroid material strike Earth’s atmosphere every day with only tiny fraction of it falling to the ground as meteorites. But the moon has virtually no atmosphere. With nothing in the way, even small pebbles strike its surface with great energy. It’s estimated that a 10-lb. (5 kg) meteoroid can excavate a crater 30 feet (9 meters) across and hurl 165,000 lbs. of lunar soil across the surface. A meteoroid that size on an Earth-bound trajectory would not only be slowed down by the atmosphere but the pressure and heat it experienced during the plunge would ablate it into very small, safe pieces. NASA astronomers are just as excited as you and I are about the potential new meteor shower. If you plan to take pictures or video of meteors streaking through Earth’s skies or get lucky enough to see one striking the moon, please send your observations / photos / videos to Brooke Boen ([email protected]) at NASA’s Marshall Space Flight Center. Scientists there will use the data to better understand and characterize this newly born meteor blast. On the night of May 23-24, Bill Cooke will host a live web chat from 11 p.m. to 3 a.m. EDT with a view of the skies over Huntsville, Alabama. Check it out. A little more than week ago a 7,000 ton, 50-foot (15-meter) wide meteoroid made an unexpected visit over Russia to become the biggest space rock to enter the atmosphere since the Tunguska impact in 1908. While scientists still debate whether it was asteroid or comet that sent a tree-flattening shockwave over the Tunguska River valley, we know exactly what fell last Friday. Now is a fitting time to get more familiar with these extraterrestrial rocks that drop from out of nowhere. The Russian meteoroid – the name given an asteroid fragment before it enters the atmosphere – became a brilliant meteor during its passage through the air. If a cosmic rock is big enough to withstand the searing heat and pressure of entry, fragments survive and fall to the ground as meteorites. Most of the meteors or “shooting stars” we see on a clear night are bits of rock the size of apple seeds. When they strike the upper atmosphere at tens of thousands of miles an hour, they vaporize in a flash of light. Case closed. But the one that boomed over the city of Chelyabinsk was big enough to to survive its last trip around the Sun and sprinkle the ground with meteorites. Ah, but the Russian fireball didn’t get off the hook that easy. The overwhelming air pressure at those speeds combined with re-entry temperatures around 3,000 degrees F (1,650 C) shattered the original space rock into many pieces. You can see the dual trails created by two of the larger hunks in the photo above. Scientists at Urals Federal University in Yekaterinburg examined 53 small meteorite fragments deposited around a hole in ice-covered Chebarkul Lake 48 miles (77 km) west of Chelyabinsk the following day. Chemical analysis revealed the stones contained 10% iron-nickel metal along with other minerals commonly found in stony meteorites. Since then, hundreds of fragments have been dug out of the snow by people in surrounding villages. As specimens continue to be recovered and analyzed, here’s an overview — and a look at what we know — of these space rocks that pay us a visit from time to time. How many times has a meteor taken your breath away? A brilliant fireball streaking across the night sky ranks among the most memorable astronomical sights most of us will ever see. Like objects in your side view mirror, meteors appear closer than they really are. And it’s all the more true when they’re exceptionally bright. Studies show however that meteors burn up at least 50 miles (80 km) overhead. If big enough to remain intact and land on the ground, the fragments go completely dark 5-12 miles (8-19 km) high during the “dark flight” phase. A meteor passing overhead would be at the minimum distance of about 50 miles (80 km) from the observer. Since most sightings are well off toward one direction or another, you have to add your horizontal distance to the meteor’s height to get a true distance. While some meteors are bright enough to trick us into thinking they landed just over the next hill, nearly all are many miles away. Even the Russian meteor, which put on a grand show and blasted the city of Chelyabinsk with a powerful shock wave, dropped fragments dozens of miles to the west. We lack the context to appreciate meteor distances, perhaps unconsciously comparing what we see to an aerial fireworks display. An estimated 1,000 tons (907 metric tons) to more than 10,000 tons (9,070 MT) of material from outer space lands on Earth every day delivered free of charge from the main Asteroid Belt. Crack-ups between asteroids in the distant past are nudged by Jupiter into orbits that cross that of Earth’s. Most of the stuff rains down as micrometeoroids, bits of grit so small they’re barely touched by heating as they gently waft their way to the ground. Many larger pieces – genuine meteorites – make it to Earth but are missed by human eyes because they fall in remote mountains, deserts and oceans. Since over 70% of Earth’s surface’s is water, think of all the space rocks that must sink out of sight forever. About 6-8 times a year however, a meteorite-producing fireball streaks over a populated area of the world. Using eyewitness reports of time, direction of travel along with more modern tools like video surveillance cameras and Doppler weather radar, which can ping the tracks of falling meteorites, scientists and meteorite hunters have a great many clues on where to look for space rocks. Since most meteorites break into pieces in mid-air, the fragments are dispersed over the ground in a large oval called the strewnfield. The little pieces fall first and land at the near end of the oval; the bigger chunks travel farthest and fall at the opposite end. When a new potential meteorite falls, scientists are eager to get a hold of pieces as soon as possible. Back in the lab, they measure short-lived elements called radionuclides created when high-energy cosmic rays in space alter elements in the rock. Once the rock lands on Earth, creation of these altered elements stops. The proportions of radionuclides tell us how long the rock traveled through space after it was ejected by impact from its mother asteroid. If a meteorite could write a journal, this would be it. Other tests that examine the decay of radioactive elements like uranium into lead tells us the age of the meteorite. Most are 4.57 billion years old. Hold a meteorite and you’ll be whisked back to a time before the planets even existed. Imagine no Earth, no Jupiter. Many meteorites are jam-packed with tiny rocky spheres called chondrules. While their origin is still a topic of debate, chondrules (KON-drools) likely formed when blots of dust in the solar nebula were flash-heated by the young sun or perhaps by powerful bolts of static electricity. Sudden heating melted the motes into chondrules which quickly solidified. Later, chondrules agglomerated into larger bodies that ultimately grew into planets through mutual gravitational attraction. You can always count on gravity to get the job done. Oh, just so you know, meteorites are no more radioactive than many common Earth rocks. Both contain trace amounts of radioactive elements at trifling levels. Meteorites fall into three broad categories – irons (mostly metallic iron with smaller amounts of nickel), stones (composed of rocky silicates like olivine, pyroxene and plagioclase and iron-nickel metal in form of tiny flakes) and stony-irons (a mix of iron-nickel metal and silicates). The stony-irons are broadly subdivided into mesosiderites, chunky mixes of metal and rock, and pallasites. Pallasites are the beauty queens of the meteorite world. They contain a mix of pure olivine crystals, better known as the semi-precious gemstone peridot, in a matrix of iron-nickel metal. Sliced and polished to a gleaming finish, a pallasite wouldn’t look out of place dangling from the neck of an Oscar winner. About 95% of all found or seen-to-fall meteorites are the stony variety, 4.4% are irons and 1% stony-irons. Earth’s atmosphere is no friend to space rocks. Collecting them early prevents damage by the two things most responsible for keeping us alive: water and oxygen. Unless a meteorite lands in a dry desert environment like the Sahara or the “cold desert” of Antarctica, most are easy prey to the elements. I’ve seen meteorites collected and sliced open within a week after a fall that already show brown stains from rusting nickel-iron. Antarctica is off-limits to all but professional scientists, but thanks to amateur collectors’ efforts in the Sahara Desert, Oman and other regions, thousands of meteorites including some of the rarest types, have come to light in recent years. * Attracts a magnet. Most meteorites – even stony ones – contain iron. * Most are covered with a matt-black, slightly bumpy fusion crust that colors dark brown with age. Look for hints of rounded chondrules or tiny bits of metal sticking up through the crust. * Some are dimpled with small thumbprint-like depressions called regmaglypts. These form when softer materials melt and stream away during atmospheric entry. Some meteorites also display hairline-thin, melted-rock flow lines rippling across their exteriors. Should your rock passes the above tests, file off an edge and look inside. If the interior is pale with shining flecks of pure metal (not mineral crystals), your chances are looking better. But the only way to be certain of your find is to send off a piece to a meteorite expert or lab that does meteorite analysis. Industrial slag with its bubbly crust and dark, smooth volcanic rocks called basalts are the most commonly found meteor-wrongs. We imagine that meteorites must have bubbly crust like a cheese pizza; after all, they’ve been oven-baked by the atmosphere, right? Nope. Heating only happens in the outer millimeter or two and crusts are generally quite smooth. Stony meteorites are further subdivided into two broad types – chondrites, like the Russian fall, and achondrites, so-called because they lack chondrules. Achondrites are igneous rocks formed from magma deep within an asteroid’s crust and lava flows on the surface. Some eucrites (YOU-crites), the most common type of achondrite, likely originated as fragments shot into space from impacts on Vesta. Measurements by NASA’s Dawn space mission, which orbited the asteroid from July 2011 to September 2012, have found great similarities between parts of Vesta’s crust and eucrites found on Earth. We also have meteorites from Mars and the Moon. They got here the same way the rest of them did; long-ago impacts excavated crustal rocks and sent them flying into space. Since we’ve studied moon rocks brought back by the Apollo missions and sampled Mars atmosphere with a variety of landers, we can compare minerals and gases found inside potential moon and Mars meteorites to confirm their identity. Scientists study space rocks for clues of the Solar System’s origin and evolution. For the many of us, they provide a refreshing “big picture” perspective on our place in the Universe. I love to watch eyes light up with I pass around meteorites in my community education astronomy classes. Meteorites are one of the few ways students can “touch” outer space and feel the awesome span of time that separates the origin of the Solar System and present day life. With all the various space rocks flying by and into Earth last Friday, perhaps you’ve been wondering about the correct terminology, since a rock from space has different names depending on what it is made of and where it is. 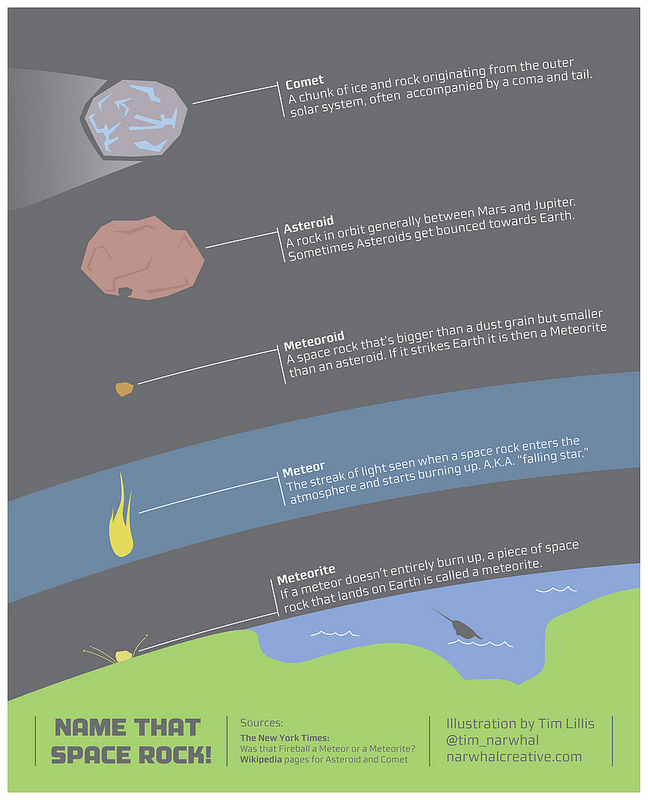 Infographics artist Tim Lillis has put together a primer of sorts, in the form of an infographic, describing the different between a comet, asteroid, meteoroid, meteor and meteorite. Asteroids are generally larger chunks of rock that come from the asteroid belt located between the orbits of Mars and Jupiter. Sometimes their orbits get perturbed or altered and some asteroids end up coming closer to the Sun, and therefore closer to Earth. Comets are much like asteroids, but might have a more ice, methane, ammonia, and other compounds that develop a fuzzy, cloud-like shell called a coma – as well as a tail — when it gets closer to the Sun. Comets are thought to originate from two different sources: Long-period comets (those which take more than 200 years to complete an orbit around the Sun) originate from the Oort Cloud. Short-period comets (those which take less than 200 years to complete an orbit around the Sun) originate from the Kuiper Belt. Meteors. Another name commonly used for a meteor is a shooting star. A meteor is the flash of light that we see in the night sky when a small chunk of interplanetary debris burns up as it passes through our atmosphere. “Meteor” refers to the flash of light caused by the debris, not the debris itself. If any part of a meteoroid survives the fall through the atmosphere and lands on Earth, it is called a meteorite. Although the vast majority of meteorites are very small, their size can range from about a fraction of a gram (the size of a pebble) to 100 kilograms (220 lbs) or more (the size of a huge, life-destroying boulder). Thanks again to Tim Lillis for sharing his infographic with Universe Today. For more info about Tim’s work, see his Behance page, Flickr site, Twitter, or his website. About 100 tons of meteoroids bombard the Earth’s atmosphere every day. For spacecraft in Earth orbit, a collision with these particles could cause serious damage or catastrophic failure, and a hit on an astronaut or cosmonaut conducting extra-vehicular activities in space would be life-threatening, if not fatal. But before anyone steps outside the space shuttle or the International Space Station, NASA checks with data from Canadian Meteor Orbit Radar to determine if it’s safe. Using a series of ‘smart cameras’, a one-of-a-kind triple-frequency radar system and computer modeling, CMOR provides real-time data, tracking a representative sample of the meteoroids around and approaching Earth, which are traveling at hypervelocity speeds averaging 10 km/s (22,000 mph). The system is based at based at The University of Western Ontario. “When it’s in orbit, the largest danger posed to the space shuttle is impact from orbital debris and meteoroids,” said Peter Brown, Western physics and astronomy professor. By knowing when meteoroid activity is high, NASA can make operational changes such as shielding vulnerable areas of the shuttle or deferring space walks so astronauts remain protected. Brown told Universe Today that the meteoroids tracked by the system are from 0.1mm and larger, and it detects the ionization trails left by these meteoroids and not the solid particles themselves. CMOR records about 2,500 meteoroid orbits per day by using a multi-frequency HF/VHF radar. The radar produces data on the range, angle of arrival, and velocity/orbit in some instances. In operation since 1999, the system has measured 4 million individual orbits, as of 2009. NASA makes daily decisions based on the data from this system. Radio waves are bounced off the ionization trails of meteors by the radar, allowing the system to provide the data necessary to understand meteoric activity on a given day. “From this information we can figure out how many meteoroids are hitting the atmosphere, as well as the direction they’re coming from and their velocity,” Brown said. NASA says the greatest challenge is medium size particles (objects with a diameter between 1 cm to 10 cm), because of how difficult they are to track, and they are large enough to cause catastrophic damage to spacecraft and satellites. Small particles less than 1 cm pose less of a catastrophic threat, but they do cause surface abrasions and microscopic holes to spacecraft and satellites. But the radar information from the Canadian system can also be combined with optical data to provide broader information about the space environment and produce models useful during the construction of satellites. Scientists are better able to shield or protect the satellites to minimize the effect of meteoroid impacts before sending them into space. The ISS is the most heavily shielded spacecraft ever flown, and uses “multishock” shielding, which uses several layers of lightweight ceramic fabric to act as “bumpers,” which shocks a projectile to such high energy levels that it melts or vaporizes and absorbs debris before it can penetrate a spacecraft’s walls. This shielding protects critical components such as habitable compartments and high-pressure tanks from the nominal threat of particles approximately 1 cm in diameter. The ISS also has the capability of maneuvering to avoid larger tracked objects. The original radar system was developed for measuring winds in the Earth’s upper atmosphere, and has since been modified by Brown and his fellow researchers to be optimized for the kinds of astronomical measurements currently being used by NASA. When the radar detects meteors, the software analyzes the data, summarizes it and sends it to NASA electronically. Brown’s role is to keep the process running and continue to develop the techniques used to obtain the information over time.